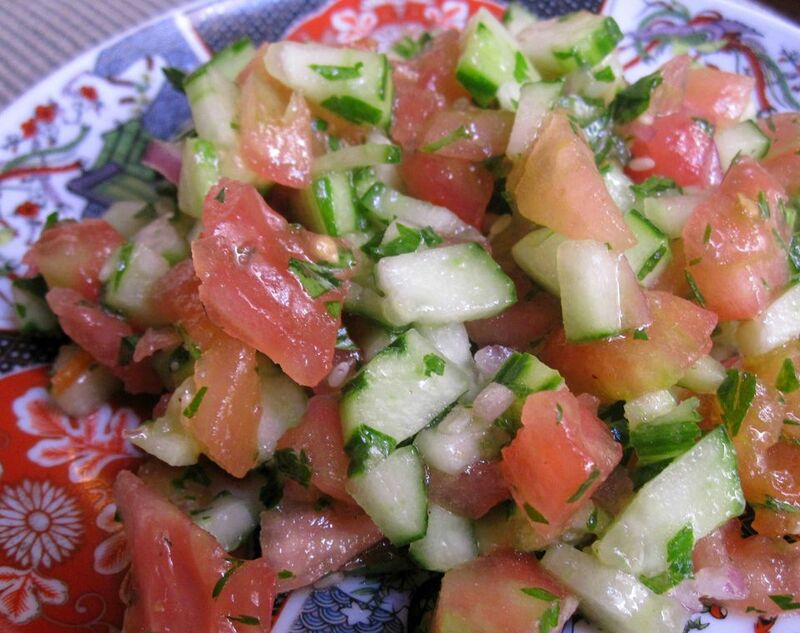 Armenian cucumbers (feggous) or regular cucumbers offer a crispy contrast to tomatoes in this Moroccan salad (shlada) with vinaigrette and fresh mint. Sometimes referred to as shlada 'arobiya (country salad) or shlada nationale (national salad), it can be served as is or used as the basis to make other salads. Mixing the salad at least 10 minutes before serving will allow the flavors to blend. A spoon can be offered, but the salad also may be eaten as a dip with Moroccan bread (khobz) for scooping it up. Lightly peel the feggous so that some dark green skin remains, and finely chop it. If using regular cucumbers, you'll want to remove the seeds before chopping. Blanch and peel the tomatoes, seed them and chop them into small pieces. Mix the tomatoes with the feggous, parsley or mint, onion, lemon juice or vinegar, oil, and salt and pepper to taste. If time allows, leave the vegetables to marinate at room temperature or in the fridge for up to an hour. Serve in small bowls or on individual salad plates.